A home loan is simply a term used to explain either the purpose of taking finance for home improvements or describing a homeowner loan, a loan secured on your property - like a mortgage. 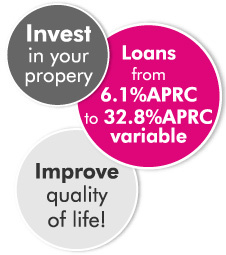 Any form of home loans that are used to improve the look of your property can have two obvious benefits. Loans Warehouse is a leading UK finance broker, offering a wide range of homeowner loans (aka home loans) for almost any circumstance. As a trusted UK broker, we can access more home loan options than you could ever imagine and our experienced advisors can make recommendations on which plan is most suited to your specific needs. Getting it right is what we do, every day. Thousands of people in the UK have taken out a homeowner loan to pay for home improvements. By using their home to secured the loan, they have benefitted from lower rates and repayments than many unsecured options. Loans Warehouse are currently offering homeowner loans up to £2,500,000 with low rates, no up front fees and no credit search footprint. Use our homeowner loan calculator and see how attractive our rates really are. So why not start on those home improvement plans today and add some real quality and value to your home, whether it’s a beautiful extension, some slick room modifications or a smart loft conversion. Call us or apply today, and we’ll search the market for the best deal we can find for you.